Raumfahrt - Nächster Job für US Air Force: Space Cop? Mars-Chroniken - Ist das ein Impact Krater auf dem Mars? 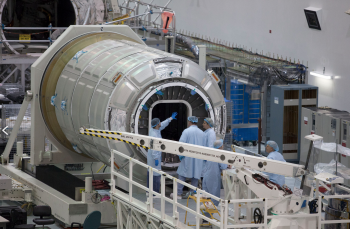 WASHINGTON — Citing a desire to both maximize the cargo delivered to the International Space Station and ensure it stays on schedule, Orbital ATK said Nov. 4 it will launch its next Cygnus mission on an Atlas 5 rather than its own Antares rocket. Orbital ATK said that the OA-7 Cygnus mission, previously planned to launch on an Antares rocket from Wallops Island, Virginia, will instead launch on a United Launch Alliance Atlas 5 from Cape Canaveral, Florida, in the spring of 2017. 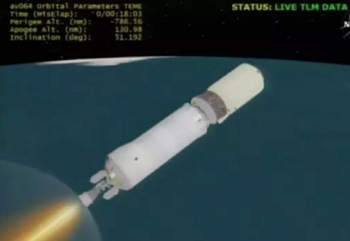 The company said this is a one-time arrangement, with future Cygnus launches returning to the Antares. Launching on an Atlas, DeMauro said, allows the Cygnus to carry more than 300 kilograms of additional cargo versus using an Antares. The OA-7 mission will be able to accommodate more than 3,500 kilograms of cargo in its pressurized module, as well as an external cubesat deployer from NanoRacks, bringing its total capacity to about 3,600 kilograms. DeMauro said there were no issues with the upgraded version of the Antares that launched for the first time Oct. 17 on the OA-5 Cygnus mission. However, moving the launch to the Atlas does give the company’s workforce “margin flexibility” to prepare for the next launch, which now is likely to take place in the middle of 2017. “It is fair to say that the Atlas will have a higher probability of supporting that mission in the spring, even though we do believe Antares would have done that,” he said. That additional performance and schedule assurance comes as two other cargo spacecraft that support the ISS suffer delays. Launches of SpaceX Dragon spacecraft are on hold as the company continues an investigation into a Sept. 1 explosion of a Falcon 9 during preparations for a static-fire test. The next Dragon mission, previously scheduled for November, is now expected to take place no earlier than January, depending on when the Falcon 9 returns to service. A Japanese H-2 Transfer Vehicle mission also experienced delays because of a spacecraft leak found during launch preparations. That mission, originally planned to launch in early October, is now scheduled for Dec. 9. 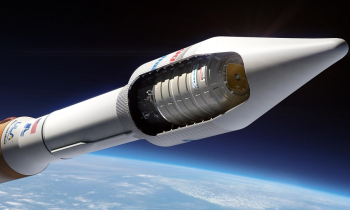 DeMauro said Orbital ATK’s Commercial Resupply Services (CRS) contract with NASA gives the company flexibility to switch launch vehicles for Cygnus missions. He declined, though, to discuss any increased costs to Orbital ATK by switching launch vehicles or if NASA will pay more for this mission as a result, citing proprietary company financial information. From an operational standpoint, DeMauro said there will be little difference between OA-7 and two previous Cygnus missions that launched on Atlas 5 vehicles in December 2015 and March 2016. 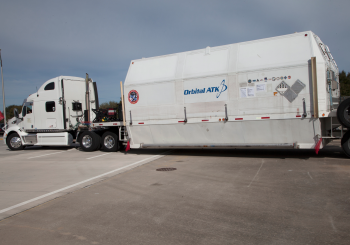 Orbital ATK ordered those launches to continue cargo services after the failure of an Antares rocket carrying another Cygnus spacecraft in October 2014. DeMauro said the company will use the same payload processing facility at NASA’s Kennedy Space Center for the OA-7 mission as it did for the two previous ones, and follow similar procedures to prepare the spacecraft for launch. “That’s one of the things that enabled such a quick turnaround,” he said. After OA-7, DeMauro said Orbital ATK will resume using Antares vehicles for Cygnus mission for the remainder of its current CRS contract, likely to run through 2018. That includes two Antares launches in the second half of 2017 and two in 2018. The exact schedule of missions will depend on the overall ISS schedule and when NASA needs those missions to fly, he said. After a spectacular 12 months, which saw both its Cygnus cargo ship and its home-grown Antares booster return to flight, after a lengthy hiatus, Orbital ATK has announced that its next delivery mission to the International Space Station (ISS) will likely fly next spring, atop a United Launch Alliance (ULA) Atlas V 401. The decision apparently stems from NASA concerns about the potentially damaging impact of having both of its Commercial Resupply Services (CRS) partners—the Dulles, Va.-headquartered Orbital ATK and the Hawthorne, Calif.-based SpaceX—out of action for a protracted period of time, as was the case for several months from October 2014 and June 2015. It thus serves to satisfy the agency’s requirement for “enhanced schedule assurance” for cargo deliveries and maximizes the capacity of critical supplies destined for the station in 2017. Current plans call for Orbital ATK to launch three Cygnuses to the ISS next year. When Orbital Sciences Corp. (as it was back then) and SpaceX signed the inaugural CRS1 contracts with NASA in December 2008, both launch providers were expected to complete their respective number of missions by December 2016. Each would transport a total of 44,000 pounds (20,000 kg) of payloads and supplies to miscellaneous ISS crews, via eight Cygnus and 12 Dragon cargo vehicles. As circumstances transpired, both partners met with significant delay: SpaceX did not stage its inaugural Dragon to the station until May 2012 and in Orbital’s case it was September 2013 before an ISS crew first caught sight of an incoming Cygnus. This fulfilled a core CRS1 requirement of staging a “Demonstration” flight, before the partners were able to press ahead with their contracted haul of dedicated resupply missions. In SpaceX’s case, its first dedicated mission (CRS-1) took place in October 2012 and that of Orbital (ORB-1) came in January 2014. More recently, the catastrophic explosion of Orbital’s Antares booster, seconds after liftoff on the ORB-3 mission in October 2014, and the high-altitude breakup of SpaceX’s Falcon 9 whilst en-routeto deliver CRS-7 to the space station in June 2015, placed the CRS program in the dire situation of having both commercial partners simultaneously out of action. Matters were worsened yet further by the failure, earlier in 2015, of a Russian Progress cargo ship, which carried the potential of adversely impacting the ISS crew. 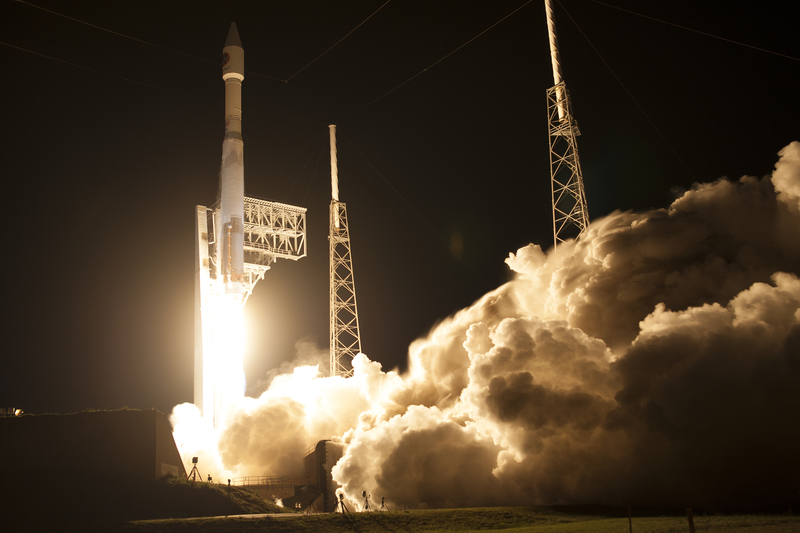 In the weeks after its Antares failure, Orbital Sciences Corp.—which merged with elements of ATK Thiokol in early 2015 to become “ATK Thiokol”—contracted with ULA to deliver at least two future Cygnus missions atop the highly reliable Atlas V 401 booster. This served to close the gap in flight operations before an anticipated resumption of Antares launches in mid-2016. A pair of Cygnuses were successfully launched atop Atlas vehicles in December 2015 and March 2016, before Antares triumphantly lofted OA-5 last month. In the meantime, SpaceX successfully returned its Falcon 9 to flight in December 2015 and launched a pair of Dragons to the ISS in April and July 2016. However, it has since met with a further setback, when a Falcon 9 exploded on the launch pad on 1 September, ahead of a standard static-firing of its first-stage engines. The incident totally destroyed the rocket and its commercial payload, the $195 million Amos-6 communications satellite. According to SpaceX founder Elon Musk, SpaceX anticipates a return to flight no sooner than December 2016, although the failure adds yet more delay to the CRS program. It is understood that the current risk-level associated with the Antares 230 booster, whose first stage is propelled by a pair of Russian-built RD-181 engines, has been met with some concern by NASA. This apparently prompted the space agency to request Orbital ATK to utilize ULA’s Atlas V, which benefits from a more rapid launch capability and offers a more promising outlook in terms of schedule adherence. As for SpaceX, it remains to be seen if the failures which triggered the CRS-7 high-altitude break-up in June 2015 and the on-pad explosion of Amos-6 last September are related. Orbital ATK brought Antares back to operational status only after several months of delays through the summer of 2016. Excluding their Demonstration flights, Orbital ATK has now flown five fully successful Cygnus missions and SpaceX has conducted eight fully successful Dragon missions. Last year, the original CRS1 allocation was extended for both partners and in January 2016 both were selected by NASA—along with Sierra Nevada Corp.—for the follow-on CRS2 contract, which will continue to resupply space station crews through the anticipated end of ISS operations in 2024. 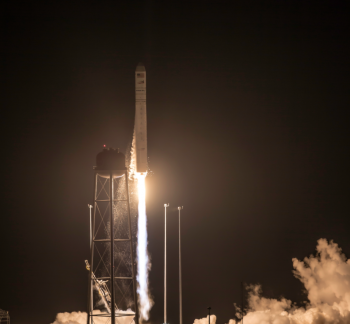 Citing exceptional and beyond performance expectations on the Return To Flight mission of their Antares rocket during the OA-5 launch of the Cygnus resupply craft to the International Space Station last month, Orbital ATK sat down with NASASpaceflight.com to discuss the realignment of the company’s upcoming OA-7 mission early next year from Antares to Atlas V – a move that will provide critical upmass capabilities for NASA to the Station. Despite initial reports that the switch of the upcoming OA-7 Cygnus resupply mission to the Space Station was moved from Orbital ATK’s newly returned to flight Antares vehicle to an Atlas V because of an unspecified issue with Antares during her RTF, Orbital ATK has reiterated again that the switch in launch vehicles has nothing to do with Antares’ performance. Antares was grounded following an October 2014 launch mishap shortly after liftoff that destroyed Antares and the Cygnus Orb-3 mission while narrowly avoiding significant and severe damage to the launch pad at Wallops and the Mid-Atlantic Regional Spaceport. In the near two year stand down of Antares launches, Orbital ATK undertook a redesign of the Antares core stage and a switch in engines to a more robust system to provide additional thrust to the launch vehicle and more upmass capability for the Cygnus itself. The Antares rocket that suffered a mishap in October 2014 was part of the 100 series of the rocket, specifically the 130. When Antares returned to flight last month, it debuted its new 230 variant configuration. In a one-on-one interview with NASASpaceflight.com, Orbital ATK Vice President and General Manager of the Advanced Programs Division at the Space Systems Group, Frank DeMauro, discussed Antares performance on the OA-5 launch. To this end, Mr. DeMauro clarified that Antares was not the reason why Orbital ATK and NASA decided to switch the OA-7 mission to an Atlas V.
“This decision to switch to the Atlas had nothing to do with Antares. There is nothing about this mission on OA-5 that give us any qualms about going to Antares for the next mission. “This was about helping the customer get more cargo up and, looking over the next two years as far as the schedule goes, giving them more schedule assurance. Expanding on how the decision to switch OA-7 to an Atlas V occurred, Mr. DeMauro stated that “It really came about as part of our normal process for planning missions on the contract. We’re an almost constant dialogue with NASA on mission status and hardware status. But we’re also in frequent contact with them in terms of the manifest and the traffic at the ISS. “This came out of one of those standard conversations in which we talked about their cargo plan as it was. And then the conversation went to the possibility where NASA could benefit from additional cargo on one of our upcoming flights. After examining the upcoming schedule of CRS-1 flights, from OA-7 through OA-11, Mr. DeMauro stated that the teams and the discussion quickly focused on OA-7 as the logical choice to switch to an Atlas V.
“As we discussed it, we looked at the launch manifest over the next couple of years, and it’s really a busy manifest for us. We have 5 more missions on CRS-1. As Mr. DeMauro related, the conversations regarding the switch of OA-7 to Atlas V were already in work with NASA and United launch Alliance (ULA) prior to the launch of OA-5 last month. With specific regard to the amount of upmass increase the switch to Atlas will afford the OA-7 mission, Mr. DeMauro noted that it will be a little more than 300 kilograms, or roughly 700 pounds. “It’ll be very similar to the mission we flew on OA-6. We’re going to carry over 3,500 kilograms of cargo inside the cargo module and also the external CubeSat Deployer for NASA as well. This extra 300 kg on OA-7 will be in addition to the contracted CRS-1 cargo upmass requirements Orbital ATK currently has with NASA. Mr. DeMauro also specifically noted that the additional upmass on OA-7 will not be making up for any upmass lost on previous Cygnus flights. Importantly, Mr. DeMauro discussed the fact that Orbital ATK’s discussions with NASA regarding switching a Cygnus to Atlas only involved the move of one mission. With OA-7 now scheduled for an Atlas, no further CRS-1 contract Cygnus’ are under discussion to fly on any launch vehicle aside from Antares. Moreover, for ULA, the OA-7 mission represents the first execution of a RapidLaunch service contract after the company announced the initiative, due to a stockpile of Atlas V core stages and Centaur upper stages, just two months ago on 13 September 2016. As part of the announcement, ULA noted they would notionally be able to take a mission from the signing of a launch service agreement to launch within “as little as three months” – a time frame that more or less matches the four month timeframe from signing of the OA-7 launch contract to its target launch date of March 2017. 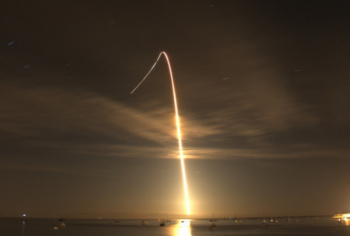 For Orbital ATK, Mr. DeMauro said, “Anytime you can get something from inking a launch service agreement to a launch in almost four months on the nose, that’s pretty impressive. So that’s pretty rapid. “In this case, Atlas had the hardware, we had our compatibility with the rocket already proven, we know the facilities, we have the same processes, and that all enabled this rapid turnaround from launch service agreement signing to launch. 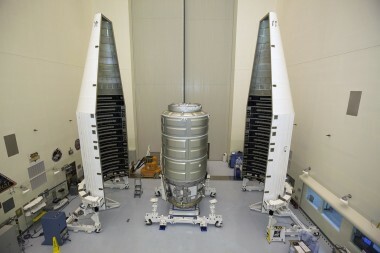 Part of the ability to take advantage of the RapidLaunch ULA offering is the fact that Cygnus was specifically designed to be compatible with multiple launch vehicles, including the Atlas V.
Also enabling this RapidLaunch initiative for OA-7 is the fact that Orbital ATK is immensely familiar with the processing facilities and Ground Support Equipment at the Cape Canaveral Air Force Station, having launched both OA-4 and OA-6 missions on Atlas Vs in December 2015 and March 2016, respectively. Looking ahead to the final months of processing for OA-7, the Cygnus that will be used for this flight is currently in its two constituent stages – the Service Module and the Cargo Module – at Orbital ATK’s Dulles manufacturing and processing facility and Thales Alenia Space’s manufacturing facility outside Turin, Italy, respectively. “The Service Module for OA-7 is complete. It’s done with all of its testing and is essentially in storage right now. As is standard for Cygnus processing, the Service Module and Cargo Module are always mated together during final processing operations that occur at the launch site itself, never at Orbital ATK’s Dulles manufacturing facility. 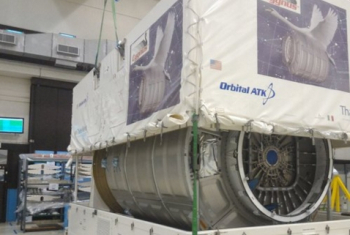 To this end, Orbital ATK plans to ship the OA-7 Cygnus Service Module from Dulles to the Cape in the middle of January – though that date is still To Be Determined. Likewise, the OA-7 Cargo Module will ship from Thales Alenia Space directly to Cape Canaveral in the second week of January. When the Service Module ships from Dulles, the crew that normally follows it from Dulles to Wallops will simply follow it from Dulles to the Cape instead. As Mr. DeMauro related, “We actually don’t have anyone permanently located at either launch site. We do all of our vehicle processing at our integration and testing facility in Dulles, and the team then travels to the launch site to put the spacecraft through its final testing and integration of the Cargo and Service Modules, get it mounted to the launch vehicle, and support the launch itself. With OA-7 now targeting March 2017, Mr. DeMauro noted that Orbital ATK will be ready to launch two additional missions of Cygnus to the ISS in 2017 on Antares. Under the current plan, OA-8 will launch sometime in the summer, followed by the OA-9 mission in late fall. However, “When we actually launch those missions is up to NASA,” stated Mr. DeMauro. “They do their analysis of when and what the traffic is like at the ISS, when they actually need the cargo, crew arrivals and departures. A United Launch Alliance Atlas V rocket lifts off from Space Launch Complex 41 at Cape Canaveral Air Force Station in Florida on March 22, 2016, carrying an Orbital ATK Cygnus resupply spacecraft to the International Space Station. Orbital ATK’s seventh contracted commercial resupply mission to the station is targeted to launch on an Atlas V rocket no earlier than March 19, bringing research, supplies and vehicle hardware to the crew members. NASA has opened media accreditation for the next Orbital ATK launch of a commercial resupply mission to the International Space Station. The Cygnus spacecraft is targeted to launch March 19, during a 30-minute window that opens at approximately 10:56 p.m. EDT. Cygnus will launch on a United Launch Alliance Atlas V rocket from Space Launch Complex 41 at Cape Canaveral Air Force Station (CCAFS) in Florida. The spacecraft will carry crew supplies and vehicle hardware to the orbital laboratory to support the Expedition 50 and 51 crews. Media prelaunch and launch activities will take place at CCAFS and NASA’s nearby Kennedy Space Center. International media without U.S. citizenship must apply by 4:30 p.m. on Wednesday, Feb. 15, for access to Cape Canaveral and Kennedy. International media without U.S. citizenship must apply by 4:30 p.m. on Monday, March 6, for access to Kennedy. U.S. media must apply by 4:30 p.m. Thursday, March 9. All media accreditation requests should be submitted online. International media are required to upload a scanned copy of their media visa and passport or green card with their accreditation requests. Media must present two forms of unexpired, government identification to enter Kennedy. One form must include a photo, such as a passport or driver’s license. Questions about accreditation may be addressed to Jennifer Horner at jennifer.p.horner@nasa.gov or 321-867-6598. For other questions, or additional information, contact Kennedy’s newsroom at 321-867-2468. Investigations scheduled on this launch include an Advanced Plant Habitat, which will integrate new technology to increase overall efficiency, reliability, and robustness of plants grown on station. This experiment will build on the success of NASA’s Veggie, the first fresh food growth system on station, and will provide ongoing research for the development of food production systems for long-duration exploration missions. Manipulating cell cultures in space is challenging as the cells can spontaneously grow in 3-D. Another new investigation bound for the U.S. National Laboratory will look at using magnetized cells and tools to make it easier to handle cells and cultures, and improve the reproducibility of experiments. The Slosh Coating experiment will investigate a special type of coating that can repel liquids when applied to container walls. If effective, the liquid repellent could be used to design more efficient storage tanks for propellant and other fluids used in space exploration. There also will be a number of CubeSats onboard Cygnus that will be deployed from the NanoRacks CubeSat Deployment on the space station, including a NASA science payload known as IceCube, which will provide data to scientists’ understanding of ice clouds and their role in climate change. The International Space Station is a convergence of science, technology and human innovation that demonstrates new technologies and makes research breakthroughs not possible on Earth. The space station has been occupied continuously since November 2000. In that time, more than 200 people and a variety of international and commercial spacecraft have visited the orbiting laboratory. The space station remains the springboard to NASA's next great leap in exploration, including future missions to an asteroid and Mars. The NASA TV schedule and video streaming information is available online. Visit the agency’s website for more information about the mission including launch countdown coverage and NASA's launch blog. WASHINGTON — A Cygnus cargo mission to the International Space Station delayed because of booster problems will not fly until at least the middle of April, a NASA official said March 28. In a presentation to the NASA Advisory Council’s Human Exploration and Operations Committee here, Robyn Gatens, deputy director of the ISS division at NASA Headquarters, said the delay will also push back a spacewalk planned to take place on the station next week. 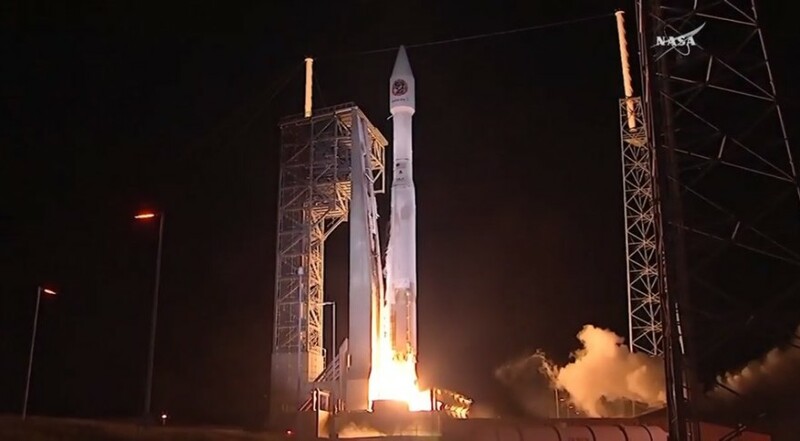 The Orbital ATK Cygnus, on a mission designated OA-7, was scheduled to launch in mid-March on a United Launch Alliance Atlas 5, but was delayed several days, first by a hydraulics issue with the rocket’s first stage and later by a problem with ground support equipment. ULA announced March 22 that the launch would be postponed again, this time because of “a different issue with a booster hydraulic line,” according to a company statement. No new launch date was announced. ULA spokeswoman Jessica Rye said March 28 that a new launch date has not been set yet for the mission. “Additional information will be provided once testing to resolve the booster hydraulic issue is complete,” she said. 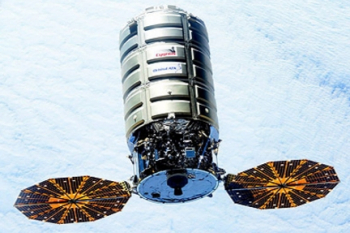 The delayed Cygnus mission comes during a busy time for space station operations. A Soyuz carrying NASA astronaut Shane Kimbrough and Roscosmos cosmonauts Sergey Ryzhikov and Andrey Borisenko is scheduled to leave the station and return to Earth April 10. A new Soyuz, with NASA astronaut Jack Fischer and Roscosmos cosmonaut Fyodor Yurchikhin on board, will launch to the ISS April 20. A SpaceX Dragon mission, designed SpX-11 by NASA, is scheduled to launch to the station in May, Gatens said. She did not give a specific launch date, but Paul Hertz, director of NASA’s astrophysics division, said during a presentation at the National Academies’ Space Science Week here March 28 that the launch is currently scheduled for May 14. Among the payloads on that mission is an astronomical instrument, the Neutron star Interior Composition ExploreR (NICER), which will be installed on the station’s exterior. “Everything’s on track for this mission,” Gatens said of the SpX-11 mission. She also confirmed that this mission will be the first to use a previously-flown Dragon capsule. Cape Canaveral Air Force Station, Fla.,The launch of the ULA Atlas V rocket carrying the OA-7 Cygnus spacecraft for Orbital ATK and NASA has been postponed. While completing testing for a ground support hydraulic condition discovered during prelaunch testing, a different issue with a booster hydraulic line was observed. The team is developing a plan to resolve the issue and a new launch date will be determined. The Atlas V and Cygnus spacecraft remain secure. Rocket/Payload:A United Launch Alliance Atlas V 401 will launch Orbital ATK’s Cygnus™ spacecraft on the initial leg of its cargo resupply mission to the International Space Station (ISS). Mission Description: Orbital ATK developed the Cygnus advanced maneuvering spacecraft to perform ISS cargo delivery missions under the Commercial Resupply Service (CRS) contract with NASA. At a total weight of approximately 7,225 kg (15,928 lb), OA-7 will include approximately 3,380 kg (7,452 lb) of internal cargo and an 83 kg (183 lb) external deployer carrying CubeSats. Launch Notes: This mission marks the third time ULA’s Atlas V has launched Orbital ATK’s Cygnus™ spacecraft on its way to the ISS. 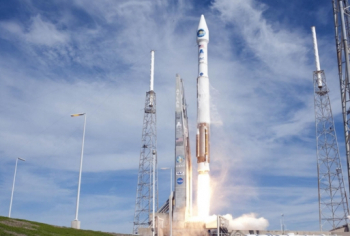 OA-7 will be the 71st launch of the Atlas V rocket since its first launch in 2002. The Atlas V 401 configuration rocket has flown 35 times, supporting a diverse set of missions, including national security, science and exploration, commercial as well as International Space Station resupply.